This is for all those people out there who don't know which way to read a tide and current book. I've been working on a nice little worksheet to remind myself about what the tides and currents will look like day to day. These worksheets use data from the Canadian Tide and Current tables and allow you to pencil the information into boxes. I know there are some online utilities and atlases to get the same info, but I find I commit things to memory better by writing and calculating, and in the end I'll get a doc that I can take on the 'yak for reference. After a while these sheets will just become Dumbo's magic feather, and you can know all the reference ports in your usual paddling areas off heart. The point of these sheet is to have all the adjusted data for quick review and learn a little about the area while you're at it. The formula is pretty much adopted right from the instructions in the guide. I suggest filling them in with waterproof and smudgeproof pencils or a pen with truly waterproof ink if you intend to bring the sheet on your trips. Normal ballpoints will bleed when the paper is accidentally exposed to water. Also print them on a laser printer instead of an inkjet. Without further ado, here's the instructions on using the worksheet. The first section is tide heights. Before you can predict any of this stuff, you need to know where you're paddling. 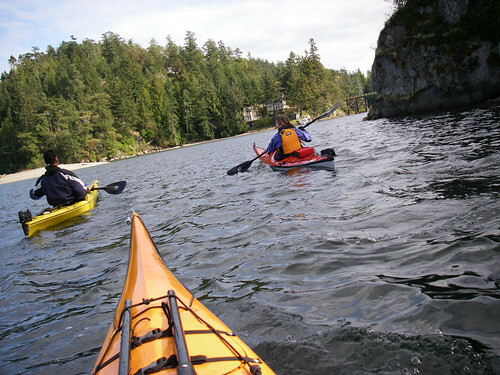 For example, I want to paddle in a part of Victoria BC called Oak Bay. So the first thing I want to do is flip to the Reference Ports near the back of the book and have a look at the area. In Secondary Reference Ports, I see Oak Bay, and it's primary Port is Victoria. The Reference port is Victoria, so just go ahead and copy the information for the day you'd like to paddle into the top set of times and heights using Victoria's data from the front of the book, you'll adjust it in the next steps. Flip back to that secondary information about oak bay. You'll see position coordinates and a set of adjustments that match up to the worksheet. Fill in this info. At the end of the row, you'll see an indication of what is considered a "large tide" for the area. 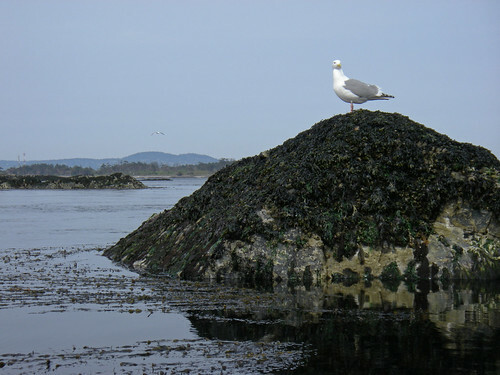 If any of your tide predictions exceed that number, you will use it in calculating one full tide cycle. You're ready to fill in the adjusted data area. If you noted a large tide, check the boxes for the affected tide cycle. Otherwise, fill in the adjusted time if the book says 0326 and the time difference is +058 you add 58 minutes to that number to get your watch time. The book is published in PST in my part of the world, so in the spring I spring forward an hour. The total time difference would end up being 1 hour 58 minutes. This rule goes for calculation of currents later on. and an easy to read high and low tide level. The next section is Currents. You know where you want to paddle, so head back to the reference and secondary current stations section. 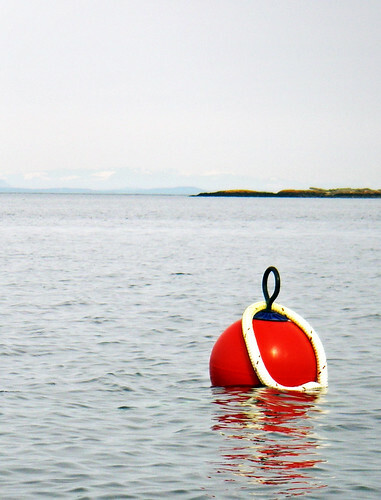 The nearest feature to oak bay in my case will be a narrow channel called Baynes channel. You can find a nearby current station quickly on a chart if you are unsure of the location of current measurement stations. As with tides, you will often use predictions at a secondary current point. Baynes Channel's reference is Race passage, so I'd copy the reference data from Race passage into my sheet. Read the information on the secondary or primary station and you will see differences in turns and maximum flow values. The turns are generally considered slack water, that is no appreciable current is predicted at these times. The maximum flows are the fastest speed the current will reach at the station. There's also a flood direction so you can expect an angle that you will drift if you are not paddling parallel to the current. a nice reference to have is a magnetic bearing so you wan use your on board compass to stay on course. Use the position area in the Tides section on the NOAA declination calculator to find how you can compensate for magnetic north. As with the tides, use the turn and flow differences to calculate the watch time for turns, and max flow. Adjust the rates according to the percentages for flood and ebb flow. A negative number indicates an ebb; a positive number indicated a flood. Indicate the adjusted flood direction in the box on the left and you'll have a completed worksheet with all the info you need for the day's paddle. Always remember to compare what you see and experience on the water with the predictions. I found this was a great way to build confidence in going with nature and not head on into its fury :). Have fun and I hope these help to be safer on the water. A beautiful day today and great overall sea conditions right on schedule. Today was an afternoon paddle out into Cadboro bay and out to the chains. I was trying to plan this outing around the currents and for the most part, we got a nice slack tide and no appreciable wind. I was going to see how much I could trust the tide and current book today and it seemed to be pretty accurate on the timing, but there were some interesting current streams of variable speed as well as a large flotilla to avoid. We left gyro and headed out to see what the current was up to at 10 mile point. When we left the beach, the tide was wayyyy out and in many places we could see the sea floor. It looks like some sort of fish was busy making more fish. 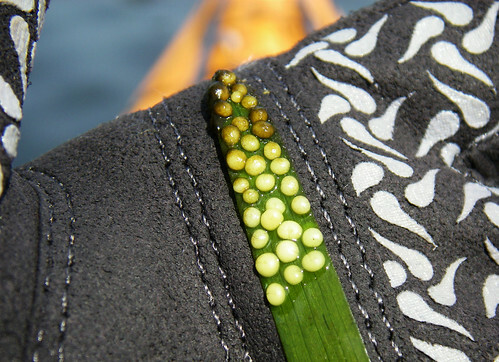 an errant piece of eelgrass drifted by the boat and I took a photo of the eggs attached to its tip. There was also some kind of yacht club party going on and we decided it was best to avoid them for a few minutes. We went and tested out the current at the cadboro point light and found it to be pretty much dead calm. On our way back to Jemmy Jones Island, we had to watch the flotilla's pattern to figure out when and where to cross over to oak bay. They appeared to turn just before entering Baynes channel, so we just headed out around them. 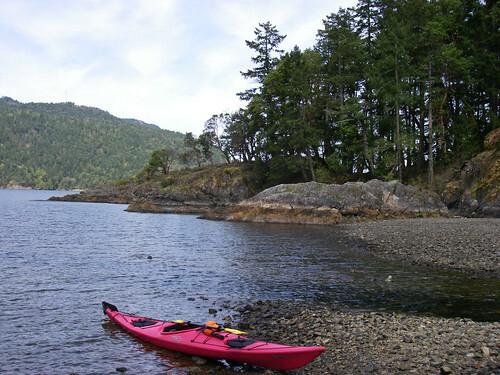 Once we approached fiddle reef, I decided to part ways with my paddle buddies and head to the Chain islands while they went to Mary Todd Island. We'd just meet up back in Gyro park. We were about an hour past slack at this point and the water was starting to get a little more messy as the flood took over. As I took off from the group I paddled hard into the first eddy line and felt a fun little rush of water go under my hull. I had a giant grin all that way out to the chains and back. The rocks were covered with birds (mostly gulls). A few heron were skulking around the rocks and geese were honking right on the shoreline. The place smelled heavily of birds and fish. Today was a busy day in Cadboro Bay. As I got closer to shore, I heard a sound that was too loud to be a speed boat. As I glanced over at the bay, I saw a float plane take off! And just as the float plane left, I heard little personal watercraft roaring in from Cadboro point. It was a pretty weird feeling crossing all this traffic solo. The sailboats were just heading back to the marina in full regatta. I landed on the beach and to my surprise, my paddle partners were not back yet. I held up on the beach and waited for them to return and we went and had a look over our current predictions and compared them to what was actually out there along with discussing everything else from the last week, of course. I woke up Friday morning to my single pane windows rattling on their tracks in my apartment. I saw the trees moving a little and started to rethink my Saturna island to Pender island crossing. Instead of the forecast following the previous night's outlook, the wind was getting worse and the weather was deteriorating. I packed up the last of my gear and drove down to oak bay to have a look at the conditions out in the strait. That little fish flopped around in my stomach as I saw waves thrashing on trial island blowing huge plumes of spray in the air. Turkey head was also being drenched with angry waves as the current hit the wind dead on. Somehow though, it was still sunny, and that gave me solace. I started working out the calculus in my head and had a good long thought about my paddling skills. 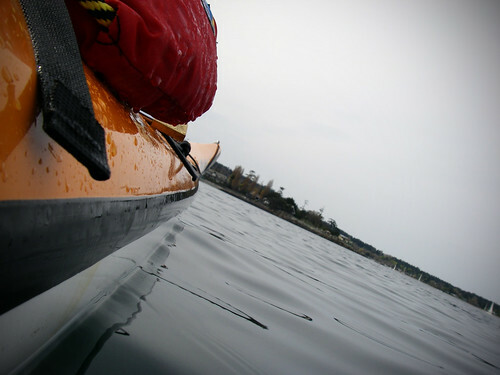 I decided I'd take the least possible risk, because as far as I knew, I was paddling alone. 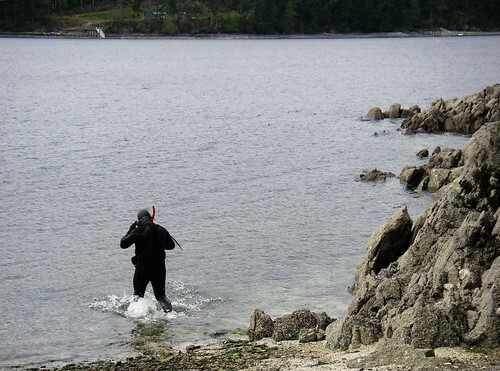 Luckily Andreas was in the lineup to go to north Pender island, too. As we looked out from swartz bay, there was just nothing. The water was clear and glassy as could be for as far as we could see. The ferry ride was clear and calm all the way out to Pender... where was this weather I saw in Victoria? Every once in a while you could see porpoises around the ferry and the sun was warm and inviting. I noticed a few clouds trickling in as we stopped at a little bakery in North Pender. 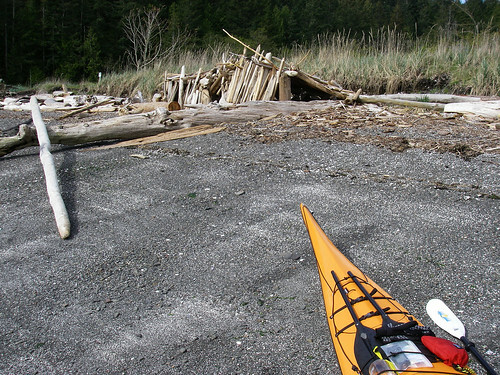 Andreas led the way to a nice little launch beach and we loaded our kayaks and put in. 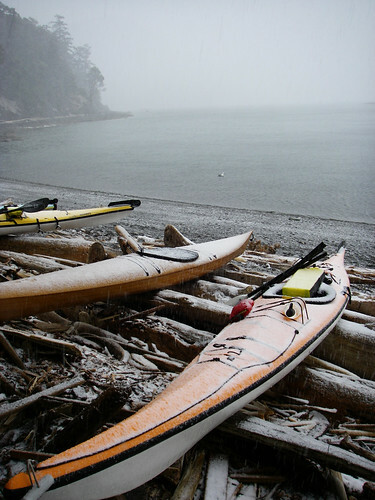 we were on our way out to meet up with some of the members from West Coast Paddler. Just as we put in, I noticed a small piece of rain bounce off the beach and thought .. oh dear. So we're paddling in a hail storm and just sort of gritting our teeth as we get soaked. The campsite is only about 2.5km from the beach, so we didn't have long to go. My first priority was to set up and then listen to the weather. 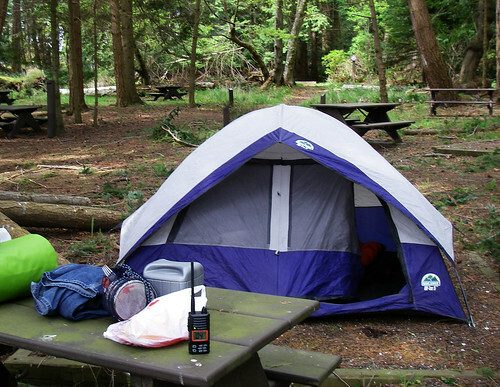 I set up my tent and sleeping gear and left the radio on weather while I worked. I squared everything away in preparation for the incoming system and tried to plug up the kayak as best I could. Just as I got under the group tent and got settled, it started to snow fiercely. I got acquainted with as many people as I could while I was in there. 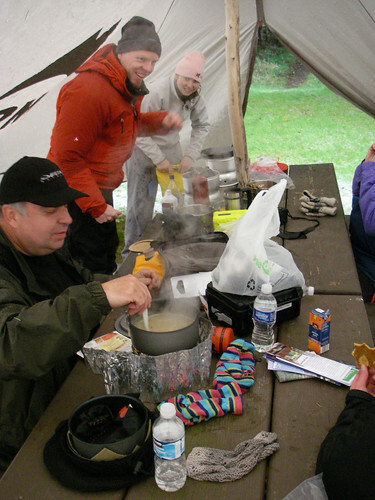 Of course being a small area with camping people - everything was branded with MSR or trangia, etc. and I got to hear about the colorful opinions shared between the factions. I'm a coleman fan, so I just boiled some water and put the stove away. The snow blew continuously for about 3 or 4 hours and there was a good bit of wind helping to chill everything down to freezing. As the afternoon progressed it cleared up a little and the wind died down. It was about that time that Mr. Payne, a suitable name in its own right, landed on the beach after an epic 35km paddle through the weather that we just sat through and that I had seen earlier in the morning. 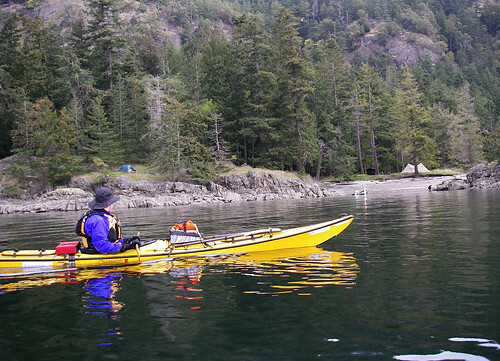 He had paddled from Smugglers cove directly up the Haro strait to our campsite near Bedwell harbour on South Pender Island. I couldn't help myself but talk this guy's ear off about the trip and the minutia of paddling. That must have been an intense trip, and by the look of his pictures. The first day closed with a beautiful sunset and calm water followed by 15 knot Southerly winds and sub zero temps with a dash of rain for sleeping. Everyone woke up Saturday morning cold and ready to make warm meals. Saturday was better behaved for the most part. The wind stayed up all morning and we kept an eye to the clouds to see when we could get on the water again. I went on a little hike around the side of mount Norman to warm up. Our first attempt to find a usable path led us right into Mick Allen, who was shaving as we walked into his bathroom rock. Mick had slid in under darkness on Friday night taking what he described as an interesting night paddle. We filed by him on our quest to find a path along the shore, but the path we were looking for was a tad overgrown. We headed back to the main path and went to the base of the climb. Most of us were massively overdressed for the climb, so we chickened out and headed back to the camp. A few people managed to get up to the summit and a few even ran it. Mick decided to go snorkeling to have a look at the local sea life. The visibility was poor in the water after being chopped up so badly by the storms, but I'm looking forward to seeing any pictures he may have gotten down there. There were a number of fishing boats and shorebirds around, which tell me it's full of sea life. We were still a bit weather bound at camp and I decided to try and slither into my damp wetsuit, so I'd have no excuse not to go kayaking whenever it decided to clear up. Not the greatest feeling at near freezing temps, but I think I was warmer in the wetsuit than long johns. We were back in our kayaks the second the weather looked less hostile. What started off as a garbage disposal mission ended up with us at a pub in port browning. The sun started to come out and the still southerly wind was at our backs throughout Bedwell harbour. There was very little current under the channel bridge and we had a nice relaxing paddle to the pub. the little choppy waves and swell allowed for a bit of surfing fun on our way into the cove. The pub overlooked mount Norman and clearing skies. We sat back and enjoyed the sudden warmth from the sun. We were joined by another group of paddlers from camp and decided to stay put for a while. Once we'd finished at the pub we put back in and went back to the campsite. This time we were treated to a northerly wind at our backs so the whole trip went without significant headwinds. There's all kinds of neat stuff on the coastal parts of the harbour - giant purple sea stars, beautiful houses, old marine eqipment and docks. Our nice afternoon paddle was just the beginning of a great evening! It was time to eat. 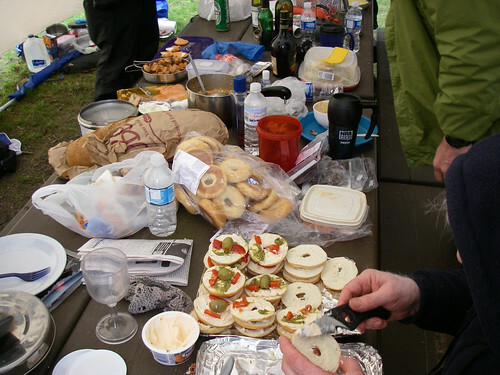 West Coast Paddler's members all agreed to bring a little potluck item so we could have a giant feast. It didn't disappoint, from shrimp cocktails to chocolate, we did dinner in style. Philip baked a few pies and cakes in his outback oven which tasted surprisingly good! Who knew you could bake a pie at camp? The potluck was a big success and I left full and happy. We did a little giveaway after with a smart looking Werner paddle going to Astoriadave, who had commuted from Oregon to be with us, and a few books and DVDs given out by a draw. I woke up at 8 and sluggishly got all my gear ready to shove off and head home. I paddled back to the cars with Andreas and we packed out leaving for the 12:30 ferry. I also had a massive burger at the stand beside the ferry terminal in otter bay... man that thing was good after 3 days of dehydrated blah. Today was a good day on the water. All things weather and marine conditions added up to a smooth, comfortable paddle with almost no wave action. This is a big contrast with last time I was here where we could barely paddle 5k over 3 foot wind waves. 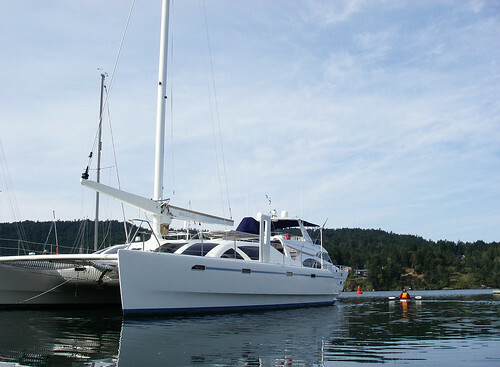 We launched from Brentwood bay just down beside the ferry terminal into a mucky low tide that the bay is famous for. It was a simple crossing at Brentwood Bay, we just missing the incoming mill bay ferry. The water was so very calm today, it felt more like paddling on a lake than the ocean. 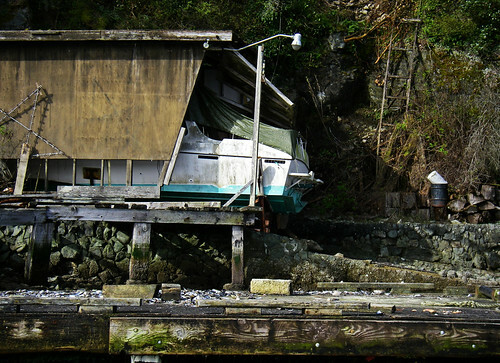 The coastline around Willis point is crowded with houses on every available rock ledge. From shacks to mansions with boathouses everything appears wantonly thrown onto the rock face and blended into the forest. We rounded the point and decided to cross to Bamberton and continue down the Malahat side of the coast. 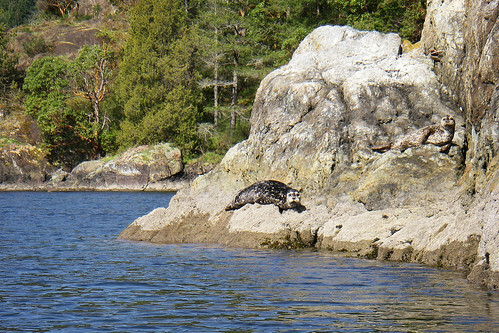 We were watched by seals throughout the voyage in Finlayson arm. As we rounded a small rocky headland populated by shorebirds and a couple of eagles, we stumbles upon two seal pups on the rocks. Luckily we had a nice swift current flowing for no reason and it let us observe them without having to having to paddle and scare them into the water. The seals knew we were there, though. We signaled the rest of the group to pass wide of the rocks. We were totally surrounded by harbour seals. you could see little heads poking out of the water everywhere. We came up to a small set of falls near Squally reach and thought about landing for a snack. Turned out everyone was perfectly comfortable, so off we went. 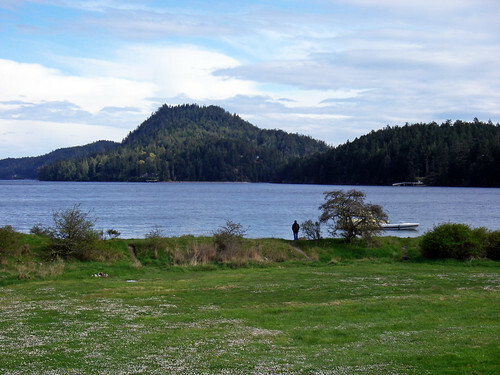 The next headland kept the south end of Finlayson arm shrouded in mystery. Instead of continuing our mission south, we crossed to elbow point and proceeded back towards the cars. 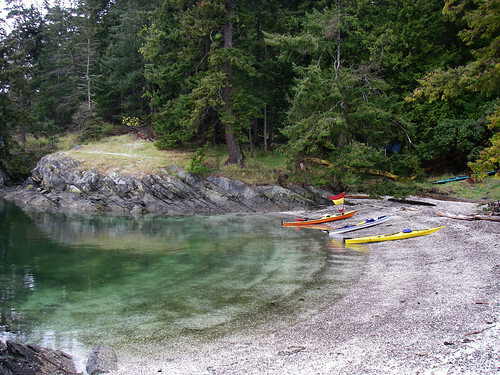 Our last little stop would be at McKenzie bight just north of the point. We landed on the beach and had a good stretch and shared around a few little snacks. It was just a short stop and soon we were on our way back to the put in. A note about the steps that lead to nowhere in Finlayson Arm / Squally Reach. 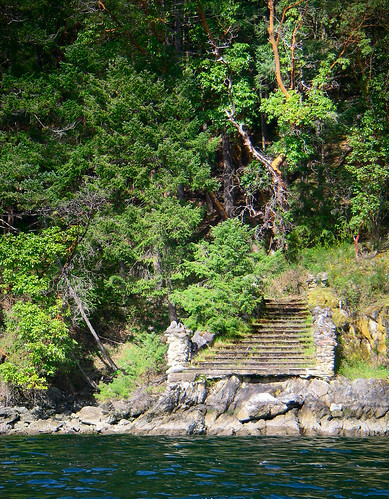 My source who used to fish in the Brentwood bay area frequently when it was a hot fishing spot tells me that these stone steps were a movie prop for an 1930s-40s era film. A nice little bit of exercise this morning. The ocean looked inviting, despite a hint of wind onshore. Sailboats of all colors and sizes were leaving Cadboro bay to take on some pretty ideal sailing conditions - slack tide, warm breeze and sun! 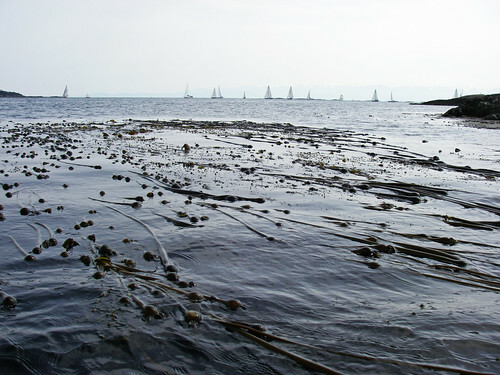 We floated out close to the flotilla and kept in the rocky areas just watching them go by. We got out around 10 mile point and the waves came up a bit accompanied by headwind. Rather than fight it, we turned around and went back riding a fun little tidal stream back through the rocks. 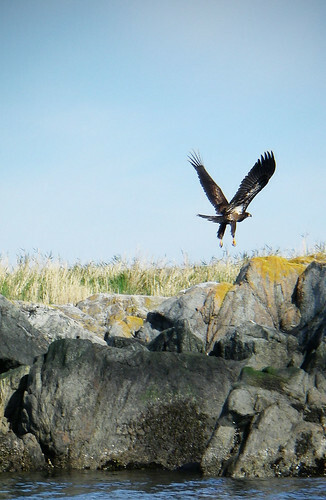 We went out around Jemmy Jones Island where an eagle took flight and then over to flower where we got to see a big number of shorebirds setting up roost or fighting with each other. Just a quick one today - Brentwood and Finlayson arm tomorrow!